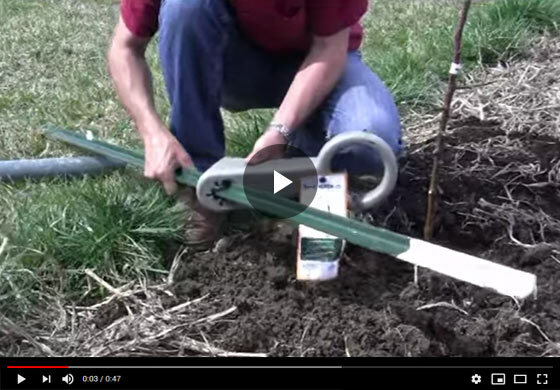 Felix, a horticulture expert from Gurney's Seed and Nursery showcases the process of installing a tree support on a dwarf or semi dwarf tree, guiding you through every step of installation. Hi, Felix with Gurney's here and today I want to talk to you about how to install a tree support for any of our dwarfing fruit trees, and here we have the tree support, you can get this from us, it's a wonderful training system and the first step is going to be to pop out this little locking mechanism here and to do that, in the back they have little push points, you can just push that through and then there's a little slack snap there, you push that on out and the piece comes out and that's to help get it onto your T-post, which we have here and that's actually step one, is to slide this onto your T-post. This side with the knobs is going to face our tree, and so we want this tree support coming off of that, and you just kind of angle it and guide that on through at an angle like that so your tree supports actually at an angle, and they don't slide right on down like its doing here here. Okay, so that's step one, the other component that we want to do is you want to slide off this ring, you see, this snaps and push this component of the hoop off. That allows us to slide it around the tree nicely. So we slid the tree guard down the T-post and we positioned it right by our newly planted tree and this has to do with how far apart an T-post is from the tree location. So we just want to have the tree guard in place where we want it and we have the tree growing right up in the middle of this ring. So that's positioning this T-post in the proper spot and then we can drive the T-post. Okay, so we've driven our T-post into place and removed support up a little bit, so it would not be abrading our newly planted tree. So now we can slide that into place. Folks, where we wanted it is about two feet off the ground on a newly planted tree. That's where we put it into place and when it's blocked in there's a little base portion in the support that slides right in between two points to where these knobs. So the next step is to put in our locking mechanism and you just slide that around one lip and it slides over the other, and then you just push it into place and that locks our tree guard into place. The next part is we want to take off our rubber band, which was around this ring and slide on our crescent, lock that into place, and then we just need to put our rubber band around and there are a lot of ways you can do this, but take some of the slack off, I'll wrap it around a couple of times here and stretch it out, wrap it around the tree and we have the tree supported with the rubber band so it can still move as the tree caliper expands. This rubber band will expand right along with it and that keeps the trees supported. That's all there is to it folks, so keep your dwarf or semi dwarf fruit tree from breaking over once it has a crop load and it has some size on it. This support will do that for you. Thanks for joining us at Gurney's and look for some of our other videos on how to care for our fruit trees, perennials and vegetables.